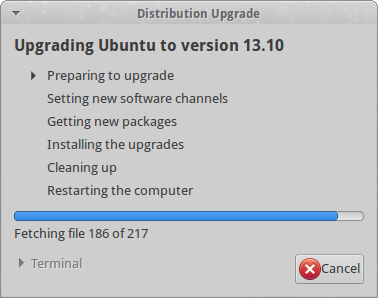 As a common 'fashion' it is possible to upgrade an existing installation of Ubuntu or one of its derivates every six months. Of course, you might opt-in for the adventure and directly keep your system always on the latest version (including alphas and betas), or you might like to play safe and stay on the long-term support (LTS) versions which are updated every two years only. As for me, I'd like to jump from release to release on my main desktop machine. 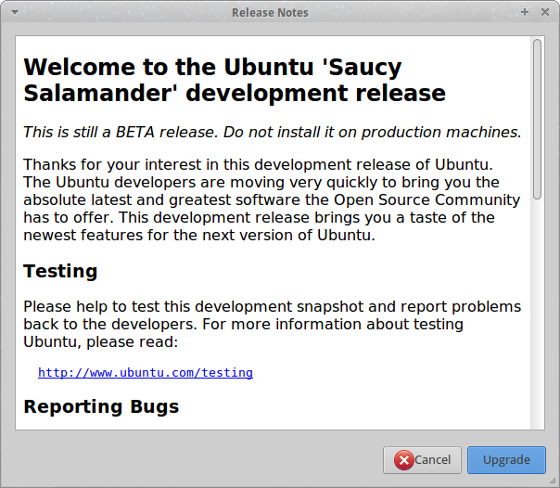 And since 17th October Saucy Salamander or also known as Ubuntu 13.10 has been released for general use. The following paragraphs document the steps I went in order to upgrade my system to the recent version. Don't worry about the fact that I'm actually using Xubuntu. It's mainly a flavoured version of Ubuntu running Xfce 4.10 as default X Window manager. Well, I have Gnome and LXDE on the same system... just out of couriosity. 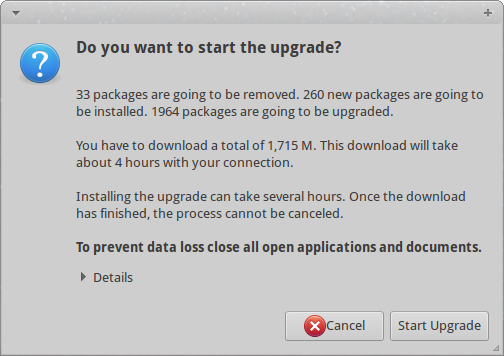 After clicking 'Upgrade...' you will be presented with information about the new version. Anyway, bye bye Raring Ringtail and Welcome Saucy Salamander! Finally, it's time to restart your system and see what's going to happen... In my case absolutely nothing unexpected. The system booted the new kernel 3.11.0 as usual and I was greeted by a new login screen.